One thing about operating a nostalgia blog like Good Morning Yesterday is that sometimes it is very difficult to help my younger readers visualize what I am talking about without pictures. 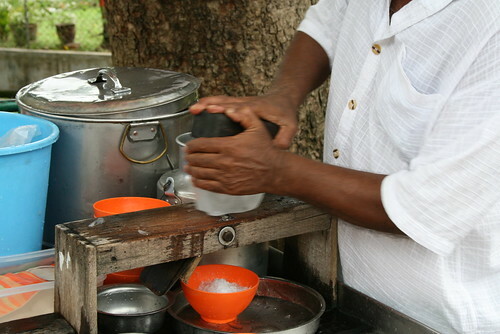 A good example is the ice balls that we enjoyed as kids. 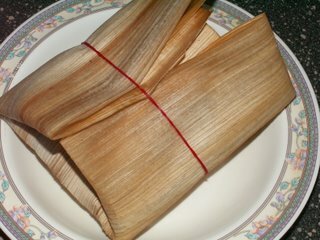 Both my friend Victor and I have blogged about it earlier. 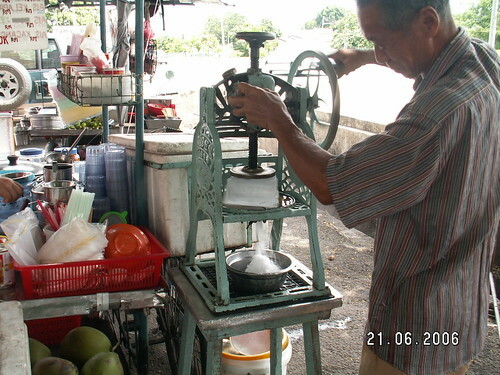 Last week, whilst visiting my in-laws in Ipoh, I spotted a roadside vendor selling chendol using the first generation ice shaver that Victor blogged about here. 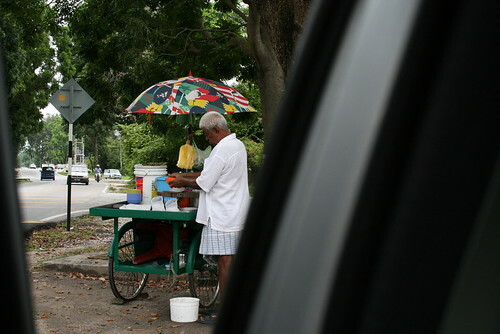 I immediately stopped my car by the roadside and bought 2 packets of chendol from him whilst my son, who happened to be with me fired away on his new Canon EOS400. I am pleased to share a few of the photos with you today. Photo No. 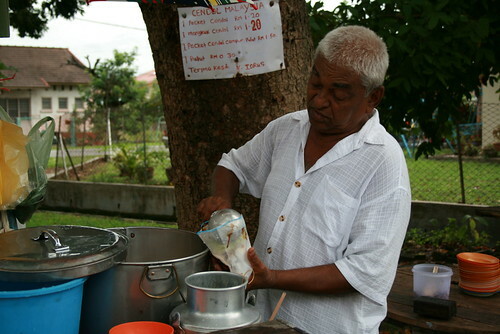 1 – This vendor was selling chendol from a tricycle along Jalan Bunga Raya in Ipoh. Photo No. 2 – A close-up of the first generation ice shaver. Photo No. 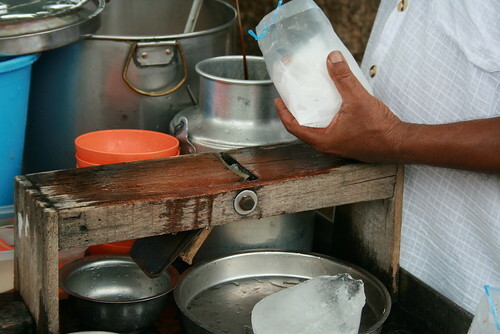 4 – Using 2 hands, he slides the block of ice back and forth over a blade mounted to the base. 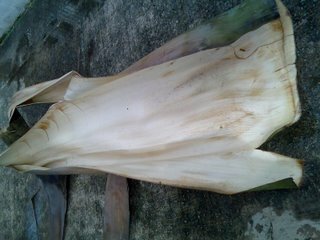 The right hand holds a wooden block with nails to grip the ice and the left hand restrains the ice to prevent it from slipping out of position. Photo No. 5 - Notice how rusty the nails are. I have a confession to make here. 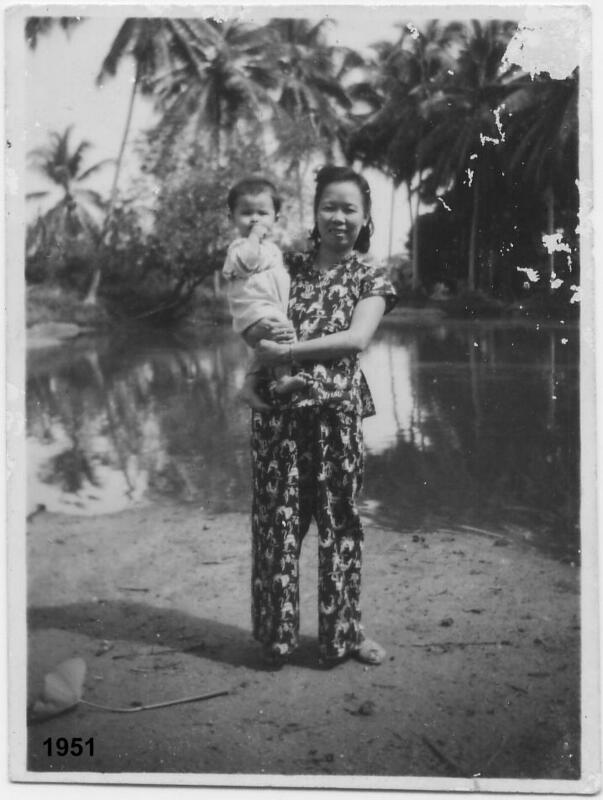 I took 2 sips of the chendol and discarded them when I got home; knowing that neither my son nor I have the same resilient stomach that I had from my kampong days. 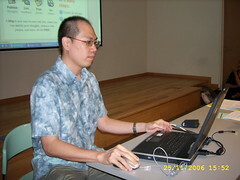 My older brother Chun Chew (Zen) will be able to testify to what an upset stomach can do to your holidays. Photo No. 6 – This is a 2nd generation ice shaver. 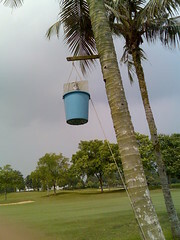 I took this photo in June 2006 along Jalan Pasir Puteh, Ipoh. Before I enrolled in Bartley, the school had a gangster problem. When I started study in the school, this problem seemed to have dissipated, thanks to the enforcement of discipline by our fierce principal Mr Jesu. He would not hesitate to call for the police if he knew any of his students took part in this nefarious activity. A case in point. 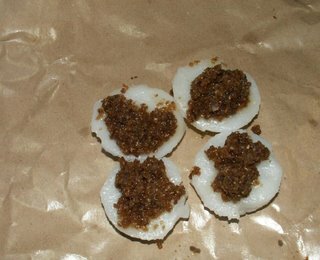 One of my primary school mates named Ah Leng, a Hainanese boy, whose father owned a coffee stall in our kampong, was misguided into a secret society. In fact he was a smart boy doing well in the primary school and when posted to Bartley, things changed. He was caught by the principal for taking part in a gang fight outside school and was referred to the police, ending his school career in a most unfortunate way. 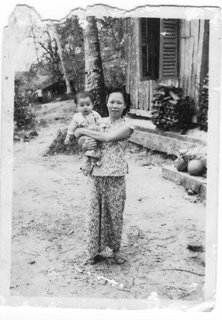 Later on, when I was working in the port, one day a stevedore called me: “Lam – how are you?” I turned around, and to my surprise, I found my long-lost friend, Ah Leng calling me. Imagine; a bright kid with a good future before him had turned into a hardened labourer, eking out for a living .. to hell with organised crime! Me (extreme left) and some of my buddies trying our best to look 'cool' and macho. One of our most colourful Indian graduate teachers was my Physics teacher, Mr Chettiar. 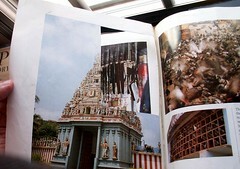 He graduated from Travancore U, southern India, with a science degree. A tall, bespectacled and skinny guy with a moustache, he had a very boring dress sense. He liked to wear white long sleeve shirts, with white pants to match, throughout the year, with an occasional switch to grey trousers. Mr Chettiar, I must say, was a benign teacher. When he got angry with naughty students, he would grimace, raising his right hand high, pretending to execute a karate chop, not quite reaching the culprit’s neck, causing a ruckus in the process. When coming to his lesson, he was like being charged with a megawatt of energy, moving swiftly from one end of the black board to the other. Just to quote one incident during his physic lesson, acting like an Indian Enstein explaining a theory of the universe, he would enthusiastically expound with a heavy Indian accent : “angalar aaxe + angalar wwhy (angle x + angle y) ….and so on and so forth…One board of calculation not enough, he rubbed off, starting another full black-board of calculations, and finally the answer. Meanwhile, I was in twilight zone. One of my class’ smartest chaps, P Chiew sprang up and said: “Mr Chettiar, I think there is a shorter cut to find the answer!” Mr Chettiar: “Oh, is it. Come and do it on the board”. P Chiew went to the black board and wrote out all the calculations and out popped the answer, done only with half a black board. Mr Chettiar felt embarrassed, and unsmilingly said: “Well the calculation is short, but still quite misleading; and worse not clear!” The class became very quiet after this. Another lady bespectacled Indian teacher named Mrs Bess, was really a beauty, as pretty as a Bollywood star. She taught us English in the lower form. A very quiet, dignified, composed person who drew plenty of unwanted attention from the male population, especially from the Indian teachers. There was another short, very good looking lady teacher (Chinese) who drove a sport car to work (forgot her name), who one day requested a mini library behind the class-room, so as to improve our English. At once Mr Jesu granted her wish without much query. 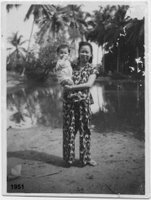 It was rumoured that this lady was from Penang and was formerly working in an airline. To the disappointment of everyone, she taught only for a short period and left the school. Indeed there were many stories of my school, but I would like to stop here, and for further inputs, I would like to fill them up in the comments section. 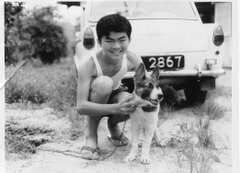 I found Chun See’s excellent blog through the links at Memories of Singapore and its pictures of Changi Village and Upper Changi Road - taken near Toh Drive where I lived in the early 1960s when my father was stationed at the then RAF Changi airbase. He kindly invited me as a UK friend of Singapore to contribute. 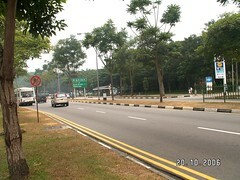 A Stretch of Upper Changi Road near Toh Crescent and Toh Drive today. 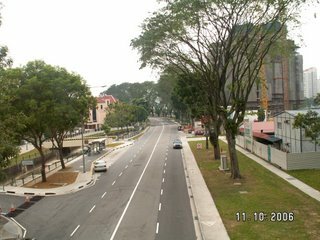 What struck me about the pictures of Upper Changi Road was how quiet the road looked – and there were no buses! 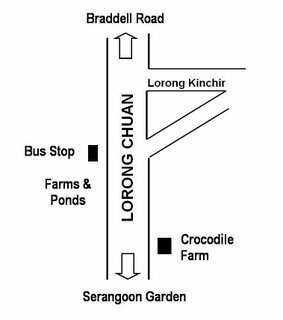 In the 1960s Upper Changi Road was the main route between Changi Village and the City and buses flew down it every few minutes at busy times. And what buses they were! They were old and well used, rattled like mad and travelled with all the windows down – and that was just as well because they had shaken and rattled so much that the window glass had gone crazed and was opaque, nothing could be seen through them! Those buses were the main means of transport for me and my friends – no Mass Transit system existed in those days. 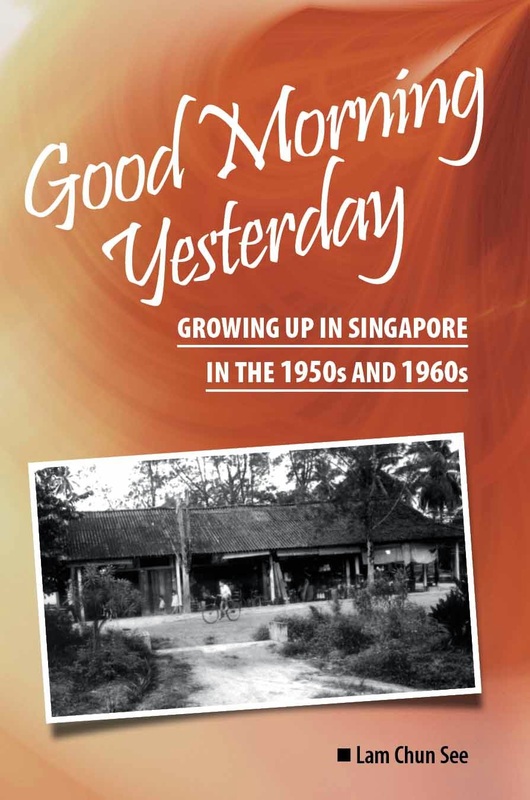 We would wait on Upper Changi Road for our frequent trips to the Village and the airbase swimming pool. Suddenly a bus would fly over the brow of the hill near Changi prison – and it might be more than one, they seemed to race each other and sometimes arrived in groups. Then we would rush onto the hard seats and spend the journey sliding around and hanging on as the bus flew onwards. There are two other things I always recall about those buses – if you travelled at night you might see the biggest cockroaches ever. And then there were the bus tickets. Well the tickets need explaining - they were small coloured card tickets and they had numbers on them. Being teenage boys we had a game with those numbers – add up the digits and if they came to a special number, like 18 or 21, then you were in luck with your girlfriend - I won’t go into more detail! I wonder if similar games go on today. So what are the buses like today? Air-conditioned and cockroach free? Driven carefully, with comfortable seats and with no rattles? I would be interested to hear from today’s Singaporeans. Footnote: Thank you and a big welcome to Brian for sharing this story from the 1960's. We look forward to more stories from him. Thanks also to Peter Tan for the photo below of 1960’s bus tickets of the Paya Lebar Bus Company. 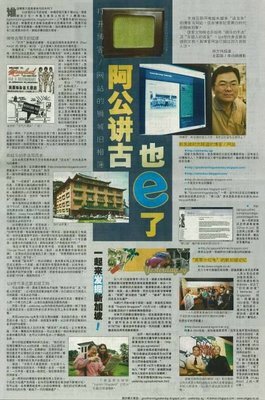 Notice the interesting way of writing "5 cents" in Chinese – Lam Chun See. 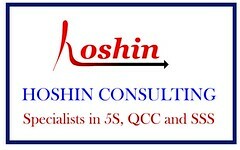 Many schools in Singapore are named after the place in which they are located. 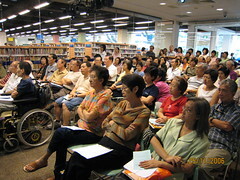 Whitley Secondary, River Valley, Dunearn, Naval Base, Bukit Merah are just a few examples. The strange thing is that, many of these schools have been relocated to other places, so much so that their names no longer reflect their geographical locations. Whitley Secondary School is a good example. 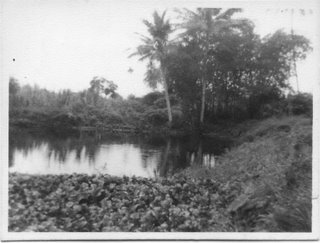 It used to be located at the junction of Whitley Road and Dunearn Road. 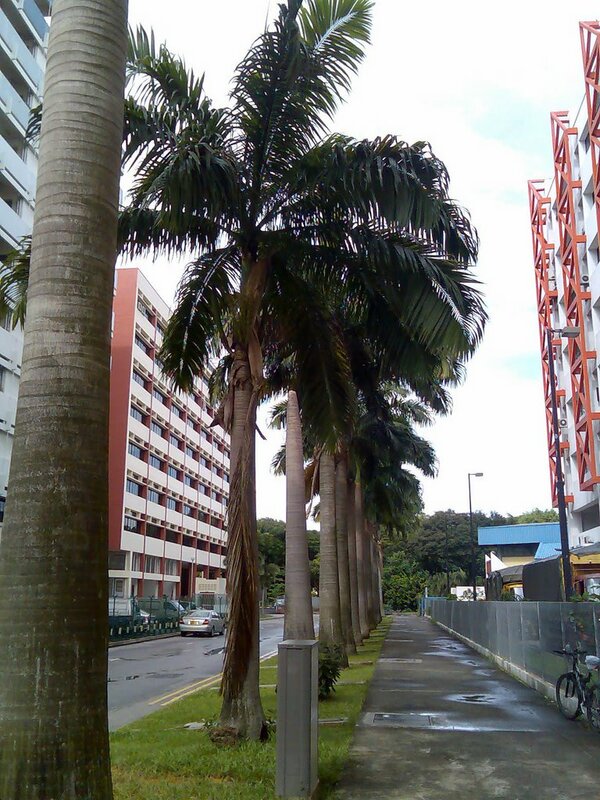 However, it was shifted to Bishan some years back and the land is now occupied by the Singapore Chinese Girls School. 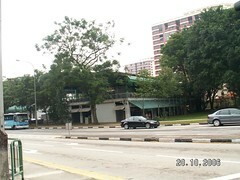 Another example is its neighbour, Swiss Cottage Secondary School which was shifted to Bukit Batok. Recently I passed by Bartley Road and found that a great deal of construction was taking place at the location where my alma mater, Bartley Secondary School used to stand. They are constructing a new MRT station there. I thought to myself - Bartley is probably going to suffer the same fate as Whitley and Swiss Cottage, by being relocated to one of the HDB housing estates and thus losing its historical character. 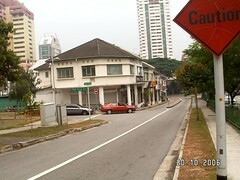 Later, I was relieved to learn that Bartley was only shifted ‘next door’ to Jalan Bunga Rampai. I take this opportunity to share with you about my days in this school. 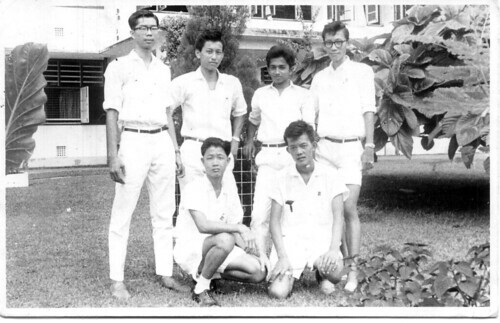 This is a 1960 photo of our class, Sec 4A. I am standing on the extreme right. Behind us is the Gurkha camp at Mt Vernon. To see a clearer version, please click on it to go to the Flickr. 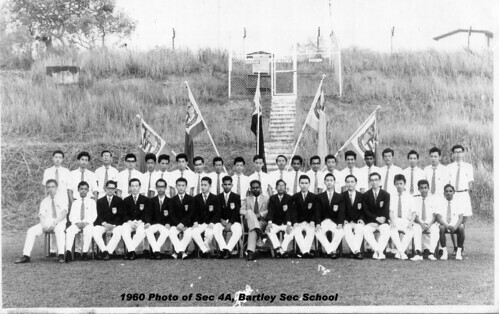 Bartley Secondary School was born in the same year as my younger brother Chun See; 1952. 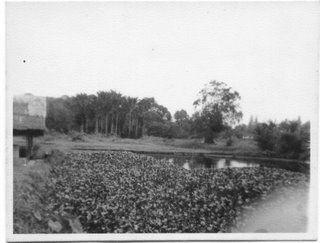 It was named after a British Government Official, and started as a co-ed school with 81 boys and 10 girls. 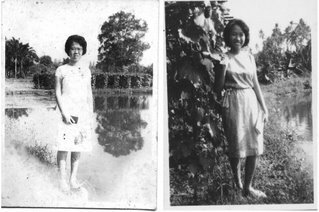 The girls left in 1956 to join the all-girls Cedar Secondary School a stone’s throw away. My sister Pat is from Cedar, incidentally. 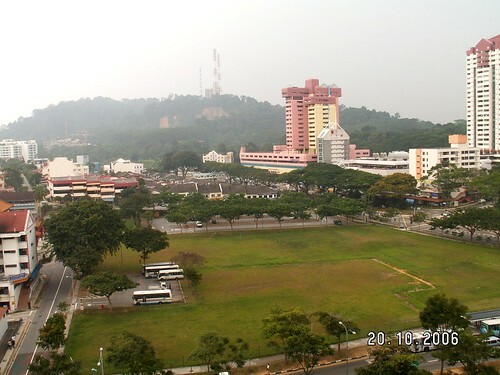 Like the rest of my siblings, I went to Braddell Rise School in my primary school. But from 1957 to 1960, I attended Bartley Secondary School. 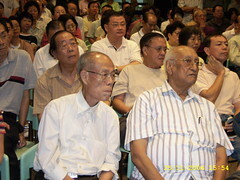 Although my father was an old boy of ACS, he did not send me there. I do not know why. But all my 3 younger brothers went to ACS in secondary school. Maybe it was too far, and thus transport cost was too high at that time. 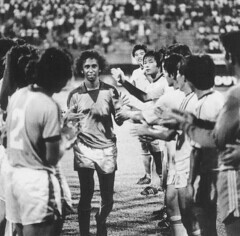 The first two years I spent in Bartley were my happiest because most of the time I indulged in seeing my school soccer team, led by Quah Kim Siak (Quah Kim Song’s elder brother) beat the daylights out of other secondary schools. 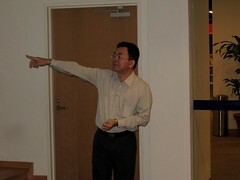 The school also had a very dedicated gymnastics teacher – Mr Loo. 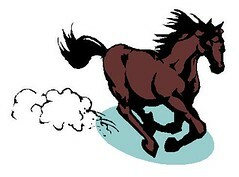 Even weaker students under his charge could perform simple basic gymnastics such as head-stand, parallel bars swings, jumping over the vault-horse, whilst stronger students were able to perform advanced gymnastics. The school had many Indian graduate teachers with colourful personalities, including the principal. Among the teachers, we had a Chinese maths teacher who was an expert magician (more about him later), a Caucasian Geography teacher, a motherly Chinese language teacher and others. This school also had a fair share of naughty boy students with girls confined only in the two Pre-U classes. My main idea of writing this article is to encourage other senior bloggers to share their nostalgic experience of their alma maters. 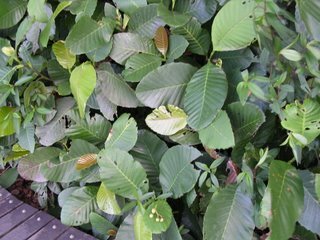 Remember this quiz question I posed 1 year ago asking you to identify this plant which supplied Chuck with bullets for his toy gun?. 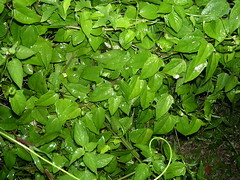 "Incidentally, there are 2 members of this family of plants that I come across frequently. 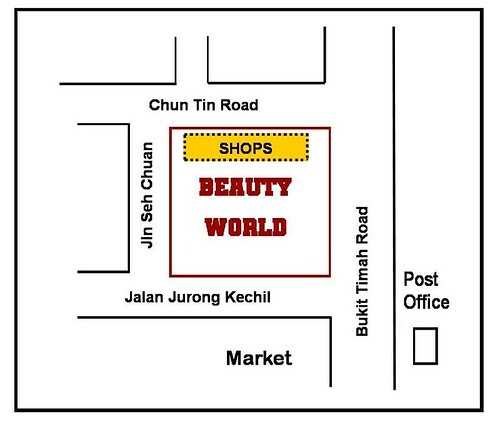 One is at Blk 60 playground, off Bedok Avenue 3 near Bedok View Secondary School. 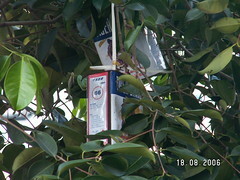 The other, a very extensive one, is hanging all along the fence, off the ECP at Tanjong Rhu. 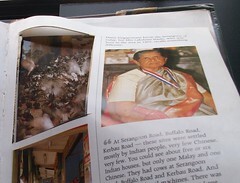 This where they are now building the Fort Road end of the Kallang - Paya Lebar Expressway which connects with the PIE ." Another mystery is this one. Chuck was told by the gardener that it was used to catch crickets. They put some chemical in the pail to attract the crickets. So it’s 2 down and 1 more to go. 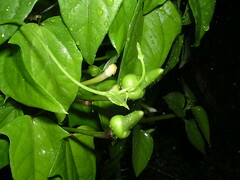 So far no one could solve the mystery of these strange fruits. The other day, I received an interesting email from an officer with the National Heritage Board asking for permission to quote a line from my earlier article, Blogging For Seniors, for one of their publications. The line in question says … "Blogging is cool. It helps us to connect with the younger generation." Re-reading my article, I began to see why they should be amused at the unusual language used by this 54-year old. I realize that at the time I wrote the article, the adjective ‘cool’ came naturally to me. I guess it is due to my frequent interaction with my teenage children and their cousins. For example, my 14-year old daughter’s verbal vocabulary of adjectives virtually consists of two words only – cool and lame. If that's the case, I hope they, the post65 MP’s are ‘intelligent’ enough not to go ahead with that foolish idea to dance the hip-hop in Chingay 2007. I think my friend Chris would love this one. He shared Clooney's Hollywood Hills home, and sometimes, his bed. He died "peacefully" of natural causes. Clooney gained custody of the porker 18 years ago, after breaking up with his then live-in girlfriend Kelly Preston, who is now married to actor John Travolta. 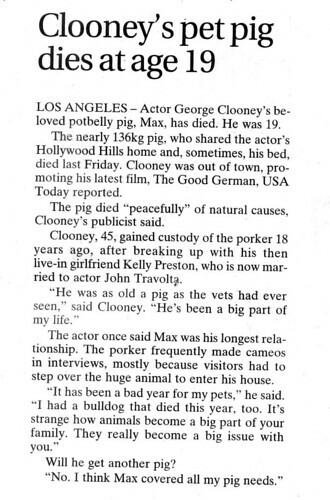 The actor said that Max (the pig) was his longest relationship. He said, "I think Max covered all my pig needs." As for me, my 'pig needs' would include this one. 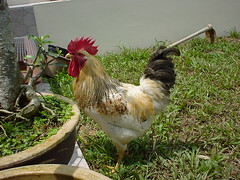 Max, say hello to Mellow, my children's pet rooster. He is coming to 6 and still going strong. 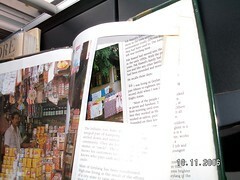 Once there was a poor scholar by the name of Lui Man Chui who sold vegetable for a living in Guangzhou. He lived with his childless young wife, in a run-down hut. 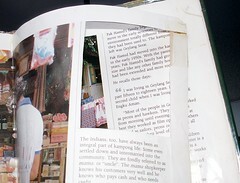 During the New Year festive season, Lui was in dire financial straits, and was unable to make ends meet. However, he still decided to bring festive cheer to his wife by buying a piece of pork from a certain butcher to celebrate the occasion. Having no money he intended to purchase the piece of pork on credit. The butcher was not around at that time. His assistant took pity on Lui's and allowed him to purchase on credit. So Lui happily went home to surprise his wife with the purchase and the wife did cook up a delicious meat soap dish but without rice to go with. 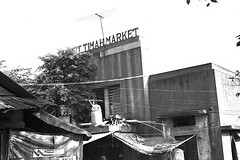 Meantime, the butcher returned to his stall and found out that his assistant had sold Lui the piece of pork on credit - flew into a terrible rage, scolded his assistant profusely, at the same time marching out to Lui's home. The poor couple were about to consume the soup with the meat, and in came the butcher shouting: "How dare you eat my piece of pork without payment !" He snatched the piece of pork out of the bowl of soup and hastily rushed out of the hut, but an evil thought struck him - "Hey, wait a minute. I may have retrieved the meat but these two hungry idiots still have soup to drink Really enjoying ha!" He returned to the hut, marched up to the couple's prayer altar and scooped up some incense ash from the altar incense holder and splashed it into the soup, leaving the poor couple speechless. 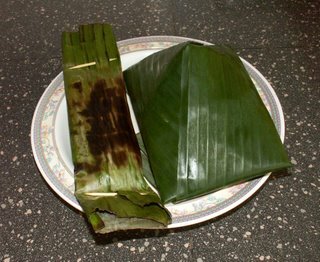 Lui was so humiliated that he vowed that should he acquire power one day, he would settle score with this 'sub-human'. Later on, Lui did pass the imperial examination and was promoted to a magistrate in Guangzhou. He returned to his home town with pomp and pageantry, but his wife had already starved to death in the hut - that was why there is a Cantonese saying: "Let your wife starve to death and stench the whole house". Lui was inflamed with hatred and soon rounded up all the town butchers. He passed a decree that all butchers had to chain one leg to their stall in the course of doing their business, thus making their lives difficult.